Change was in the air, and though I’d been tempted to stay the course and cling to my paper PsyCop license out of sheer stubbornness, I could see that someone needed to step in and take care of the repeaters, and the jellyfish, and the icky, grabby, self-entitled ghosts. That someone might as well be me. What lies are we believing to be truths? Who has been manipulating us? How much as been assumed? In a world where murders go free when PsyCop evidence is tossed out by biased judges, whose to say who the good guys are anymore? Jacob retired from his position as a Chicago PsyCop detective and is now working the FPMP – an organization who has been tapping their phones, tracking their movements, and who Vic knows for a fact has killed people, because they’ve called Vic in to clean up the repeaters. This book wasn’t as emotionally rewarding as the PsyCop stories which proceeded it. It was still witty and full of ghost action, Vic was still his charmingly awkward self… But this story lacked the Vic/Jacob connection which I’ve really come to appreciate about the series. The romance and interaction between those characters are the true strength of this series, and I felt that a great deal of focus was shifted onto other characters. 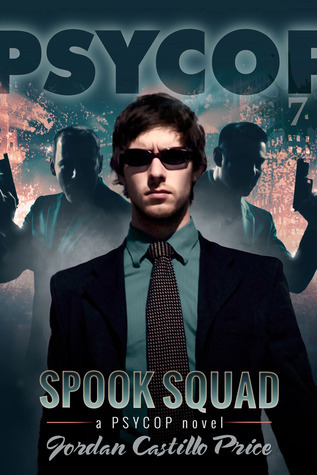 If I didn’t know better, I’d say that this book is a stepping stone – all the secondary and tertiary characters became more fleshed out in Spook Squad. It was almost as if Price was building a bridge to something with this book – at the end we had the perfect launch for a new fresh leg of the series, and the opportunity of spinoffs with several characters… But then I see that this book was published nearly two years ago and there doesn’t appear to be another PsyCop in the works. Such a shame. This book provides the perfect launch for something new for this series, and it just doesn’t seem finished to me. Maybe that’s because I’ve fallen in love with these characters and I’m greedy for more? Who knows. I shall continue to ship Vic and Jacob and hope that one day (maybe someday soon) we’ll be blessed with more of this fabulous series! I often wonder what I might have done with my life if I’d never become a cop. There was this kid who sat behind me in fifth grade. His name is long gone from my patchy memory, but I do recollect two things about him. One, he annoyed the hell out of me by wiggling his foot against the leg of my chair all day long. And two, he knew exactly what he wanted to be when he grew up: a garbageman. Not in an ironic kind of way, either. Careers in sanitation fascinated him. He drew pictures of garbage trucks like other kids drew rocket ships or unicorns. On trash day, he would set his alarm early so he’d be waiting there in the alley to get a glimpse of his heroes. If you gave him a box, he wouldn’t make something useful out of it like a car or a teleporter. He’d make a dumpster. When I hear the pneumatic wheeze of a garbage truck’s air brakes, I occasionally think of this kid, whatever his name was. I wonder if he ever did manage to live the dream, or if his parents talked him into being an accountant, or maybe a doctor. At one point in my prepubescent life, I had aspirations of joining the military. Not because I’m pro war, and certainly not because I’m good at following orders. I suspect my subconscious was grooving on the idea of being dumped into the plastic bag with a few dozen other little green army men and losing myself in a tangle of arms, legs and rifles. Real life being as disappointing as it often is, my chosen career (or the career that chose me) turned out to be a continual display of territoriality and machismo rather than teamwork. Other than my partner, Bob Zigler, I’ve never really grown comfortable with anyone at the precinct. The feeling is mutual. Sometimes the evidence of exclusion is subtle, like when conversation ebbs as I cross the threshold. Sometimes it’s overt, like finding every last pen gone from my desk when the fully stocked supply room is a hell of a lot closer to everything else, and Zig’s desk is untouched. It says something about how awkward things were that I preferred being at a crime scene to reporting back to the station and dealing with all the other cops. This aversion to groups probably started early. I grew up in group foster care with a rotating stream of snotty kids—troubled kids, I know now. I’m sure they acted like they did not because they were inherently jerks, but because they’d been starved, beaten, and molested, or at the very least, neglected. Sure, we had toys, but they were nasty second hand toys. Naked dolls. Games with missing parts. Dirty plastic action figures with the paint rubbed off. One thing I don’t remember attempting to play with is a jigsaw puzzle. I’m sure we must have had them, probably with a good handful of pieces missing from each one. But I couldn’t dredge up any specific memory of putting together puzzles. Maybe eventually I’d get the hang of it, although probably not tonight. It was already past six—and while I’d been focused on my project, the cannery had grown dim. “I’m home,” Lisa called from the foyer. My heart did a little relief-flip every time I heard her say that. Even now. All these months after we coaxed her out of the greedy clutches of PsyTrain. “I’m in here.” My voice was phlegmy from staring so hard I’d forgotten to swallow. Judging by the box lid, the puzzle seemed like it should have been fun. It featured male dancers with bare chests, bulging muscles, sparkly bowlers, clingy slacks, bow ties fastened around bare necks, and ginormous baskets. Yeah, not my type. But kitschy and stupid in a way I could appreciate. Figuring out which tab fit into which hole was a welcome distraction from the way I’d spent my day: figuring out which vehicle must be covered in minute traces of a distressed murder victim’s blood. Cops need a solid chunk of time to unwind when they clock off. I hadn’t been actively searching for something to deaden my brain after work. It just happened to be there. Jacob’s gym pals had presented him with the goofy gift at his private retirement party—the one that guys on the force weren’t privy to—along with a card that read, We’re puzzled that you’re retiring. Don’t go soft on us! Lots of people were puzzled. Not me, though. I knew exactly which carrot Regional Director Con Dreyfuss had dangled in front of Jacob to get him to join the FPMP, and more importantly, which stick he’d subtly suggested might beat Grandma Marks to death. I tried and rejected yet another piece. “They’re all skin-toned or black.” Maybe I should have started with something easier, like a bouquet of differently-colored flowers. As it was, I’d been staring at one particular dancer, a guy with a dorky come-hither look on his face, for the better part of an hour. There was a big puzzle-shaped hole in his gut where his six pack should have been. You’d think I could spot a set of washboard abs without much problem. But with masses of spray-tanned skin cut into jigsaw pieces, the body parts eventually started to blend. Lisa turned on an overhead light and joined me at the dining room table. The puzzle and I had been monopolizing the tabletop for a while now, but none of us actually ate there anyway, since meals happened on the coffee table and TV trays. Usually the big table was home to books and newspapers. Now the books were on the floor and the papers in the recycle bin…and somehow, inadvertently, I’d ended up with a new hobby. All it took was a critical need to unwind and a major life change in my partner that neither of us had seen coming. Lisa and I sat together and stared down at the die-cut cardboard pieces, and eventually she found a piece of someone’s thigh and clicked it into place. And then a smoky bit of background. And then an oiled shoulder. All the while, I continued searching for my abs. Then she found three nondistinctive gray background pieces, one after the other. Click, click, click. “Are you using the sí-no?” I finally asked. I was trying to finesse a not-quite-right bellybutton into position when the doorbell made us both jump. Since the cannery’s bell was meant to be heard over the drone and clang of heavy equipment, its chime wasn’t exactly what you’d call melodic. You don’t want to be caught holding a hot cup of coffee when it goes off. I collected my sidearm before I answered, not because I’m a paranoid nutcase, but because I’m a realist. Since I wasn’t expecting anybody, I’d need to be prepared for the possibility that some whacked-out anti-Psych had decided to visit—with a shotgun. But it turned out this time my caution was unnecessary. Yes, my visitor was scary. But at least her gun was holstered. “Is Jacob here?” Carolyn asked. Oh. Here I thought she’d been looking for him—not looking to avoid him. I stepped aside and let her in. Now, Lisa and I may not possess the type of talent where we could feed thoughts back and forth without other people being any the wiser. But we can read each others’ body language like a front page headline. Lisa shifted forward slightly. So did I. As if that wouldn’t just pique Carolyn’s curiosity. Hey, I said Lisa and I were in synch. Not that we were adept at steering a conversation. Carolyn strode past us like we’d just told her there were warm brownies in the living room that needed eating. Lisa and I turned away from each other. I shrugged. She sighed. We followed her into the main room and shot guilty glances at the big blue dome-shaped tent in the corner. Yes, it’s not something you see every day. But if it worked for the three of us, who was Carolyn to make us feel like a bunch of weirdos? I’m not even sure who’d suggested the tent. Just that after Lisa spent a few weeks on our couch, there’d been an edge to the “I should probably find my own place” discussion that sounded pretty serious to me. And Jacob’s tent was going to waste rolled up in the basement. Carolyn glanced up at the loft, where we’d be able to see down over a room divider with ease, and then looked me over to see if I was being truthful. Apparently she was satisfied; she didn’t challenge me on it. But she did subject Lisa to additional scrutiny. “Are you running from something, is that what this is? Or did something happen in California that nobody’s talking about? Because the three of you troop out there, and when you get back, suddenly you’re playing living room adventurer and my partner hands in his—” she broke off and turned away with her hand clasped against her mouth, and I realized with a sudden and awkward certainty that I was about to see hard-assed Carolyn Brinkman cry. “So don’t be judging me.” Lisa punctuated her statement with a ghetto-tastic side-to-side head move that made me realize I was seriously outclassed in this discussion. Although Carolyn was about as white bread as a person can be, Lisa’s “talk to the hand” posture didn’t daunt her. In fact, instead of backing off, she took an even closer look. “How many carats are those diamonds?” she said. Carats? Right. I was fully aware that Lisa had answered the question with a question to dodge Carolyn’s built-in polygraph—but before I could ponder why she would suddenly feel defensive about wearing costume jewelry when everyone knew it was fake, the front door banged open. His shoulders sagged, though so imperceptibly I was probably the only one who’d noticed. His impeccable suit, his carefully honed physique, even his ramrod posture, everything about Jacob was rigid, controlled perfection. A man of steel…but not inside. I’ve never wanted to be an empath—too damn confusing—but at that moment I could have really used the insight, ’cos it was a real struggle to figure out how emotions had tanked so fast. Here Lisa and I were contentedly fitting pieces of half-naked cardboard men together, and before I knew it, the atmosphere was soupy with anger, frustration, resentment and hurt. The stupid part was, we were all on the same damn side. I don’t know how she got that sentence out in a single breath, and I think she didn’t either. She stopped and blinked, and then the thought occurred to me that Carolyn didn’t really have much of a knack for hyperbole, thanks to her talent keeping tabs on her truthfulness. And then I realized she wasn’t exaggerating. That’s how Carolyn actually thought the Non-Psychs saw us. And it scared the crap out of her. How was I supposed to make Carolyn feel better when I’d just answered my door with a Glock in my hand? “Uh, I don’t know. Safety in numbers?” It was the best I could do, at least to Carolyn’s face. “More like a bigger target,” she said. Jacob looked to Lisa and me to see if either of us would tag along. I could definitely use the practice, especially at night. The Fifth Precinct requires one firearms session a year. That’s right: one. Since I’m not an overachiever, initially I didn’t put in any extra time on my own. Not until I failed my first recertification—and you only need to hit seventy percent of the targets to pass that thing. I should have jumped at the chance…but I didn’t want the FPMP to think I was easy. Carolyn didn’t call her out on these purported “plans,” so they must have existed. The awkwardness between the four of us was thick enough to cut with a spork, but at least Lisa was no longer going Jerry Springer Baby Momma on Carolyn, and Jacob wasn’t tooting the Federal Psychic Monitoring Program’s horn. I gave the ropy muscles at the back of my neck a couple of squeezes, said, “Well, I guess I’ll go see if Crash wants pizza,” and turned to retrieve my phone from my overcoat. “Vic,” Jacob said. I tensed, because I really thought I’d successfully weaseled my way out of that awkward conversation without resorting to an untruth, but I didn’t bolt when he reached toward me. I was prepared for a caress, or maybe a hug, some sort of attempt to entice me to stay and keep trying to convince the girls we were all still one big, happy family. But instead he just plucked something off the back of my shirt and handed it to me. It was a puzzle piece with a tacky smear of jelly on the back of it. I turned it photo-side up. Fake tan flesh-tone—and it looked suspiciously like a set of washboard abs.